We’ve all had the experience of seeing a Facebook ad that’s missed the mark in some way or another. Maybe it was that you very clearly weren’t the right audience (mis-targeting). Perhaps it felt like you were stuck in a bad infomercial (overselling). It could’ve been that the ad image was so astonishingly boring, you failed to even notice its existence (visual fail). You’ve likely seen what doesn’t work in Facebook advertising. So here’s what you need to know to avoid some of the most common Facebook ad mistakes. We’ll look at a few examples of brands that have succeeded. In doing so, we can determine the Facebook best practices they followed and what mistakes were avoided. Then, we’ll explain how you can use their example to improve your own Facebook marketing strategy. Learning how to advertise on Facebook like the pros means you’ll experience more conversions, expanded your reach, and boost ROI. The reality is 59% of people will only read your Facebook ad headline, and nothing more before sharing. This means you only have 25 characters (Facebook’s recommended headline length) to impress someone. 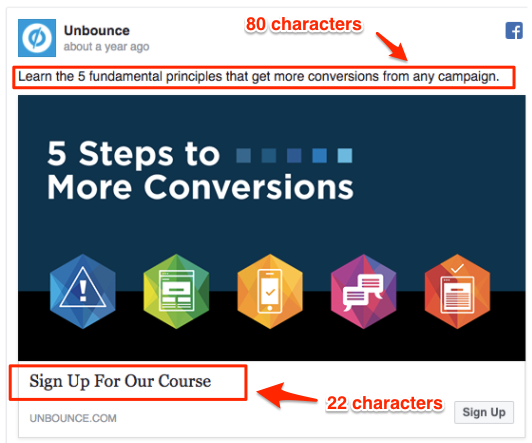 Unbounce exemplifies how simplicity can work for your Facebook ads. A strong visual keeps viewers engaged without being distracting. Meanwhile, the 22 character headline is a clear call to action. The text above falls within Facebook’s suggestions of 90 characters in the body text. This is just enough to grab the viewer’s attention without going into too much detail. One of the worst Facebook ad mistakes to make is to say too much in your headline or text. Doing so can lose customer interest and they’ll end up not clicking through. They’re either overwhelmed or see no value in clicking through to learn more – they already learned everything they need to know from your ad’s description! Video marketing is in right now, and video advertising on Facebook is no exception. People who watch videos about a product are over 1.8 times more likely to make a purchase than those who only read text. In addition to purchase intent, Facebook video ads have also been shown to increase ad recall and brand awareness. All of these factors mean video content is clearly effective and worth your time creating and launching. Sticking to the old ways of only using static photos is a Facebook mistake you just can’t afford to make. 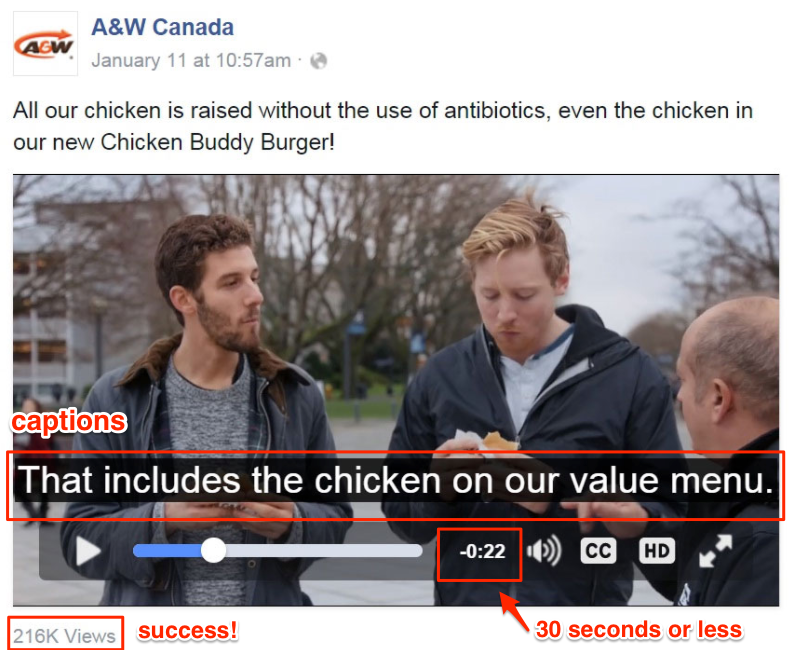 Let’s use at A&W Canada’s Facebook video ad as an example. Their advertisement reached over 216,000 views and gives some insight into how to advertise on Facebook using this medium. Including captions when using video ads on Facebook is crucial, with 85% of video watched without sound. When captions aren’t included, CTA clicks fall by 26%. The duration of the video also matters. Facebook video ads that are 30 seconds or less are the ideal length. Videos that are 16-20 seconds in length have been shown to yield the highest conversion rates, and are the most popular length for Facebook marketers. Using video advertising on Facebook is an excellent way to get greater engagement than just a photo. Just make sure to avoid classic Facebook ad mistakes that involve overstuffing the video with too much content or making it too long. As long as you keep it short and sweet, and remember to include captions, Facebook video ads should always have a place in your social media marketing strategy. Influencer marketing is fast becoming one of the most effective Facebook best practices for marketers. 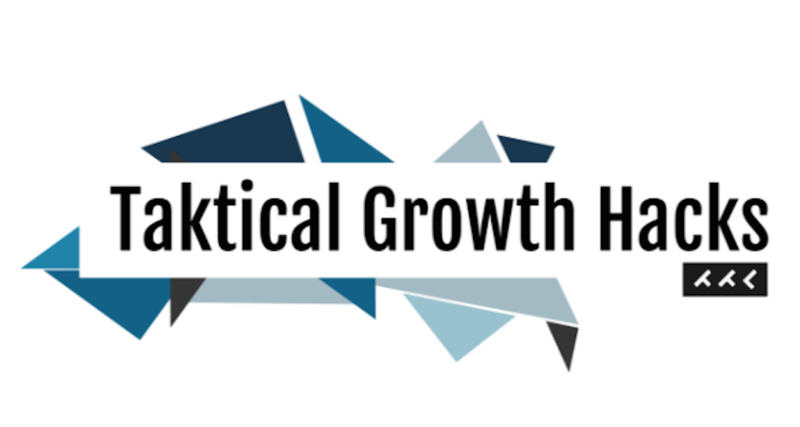 When you partner with familiar faces that are in your industry, conversions rates soar. It’s just this simple: people are more likely to trust and relate to someone like them. 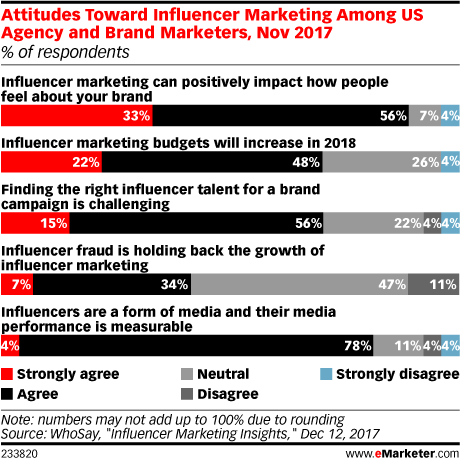 In a recent study, 48% of people exposed to influencer marketing visited the relevant retailer within four days of viewing influencer content. Partnering with notable figures in your field helps build trust. Once a potential customer trusts your brand, they’re more likely to take the next step and hit the CTA of your Facebook ad. One of the worst Facebook ad mistakes to make is rushing customers through the sales cycle. If they feel pressured, they’ll be less inclined to click and convert. 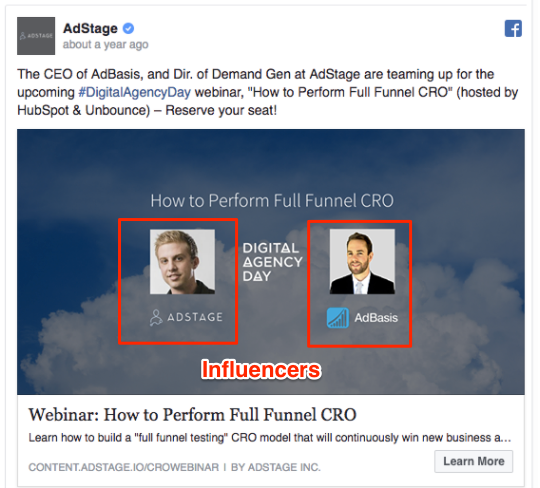 Take a look at AdStage’s Facebook ad for an example of how to do influencer marketing right. They not only mention the influencers they’re highlighting in the caption, but also include visual proof via their headshots. 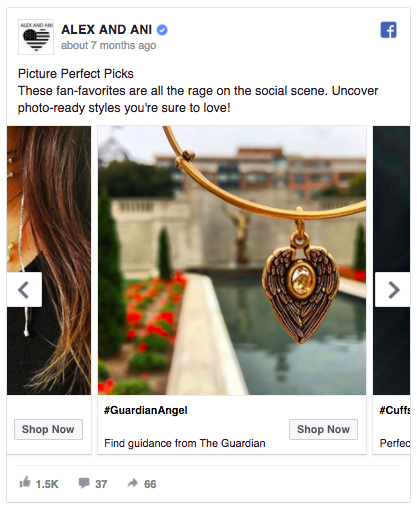 A photo goes a long way to enhancing the foundation of trust you’re building with consumers via this Facebook ad strategy. 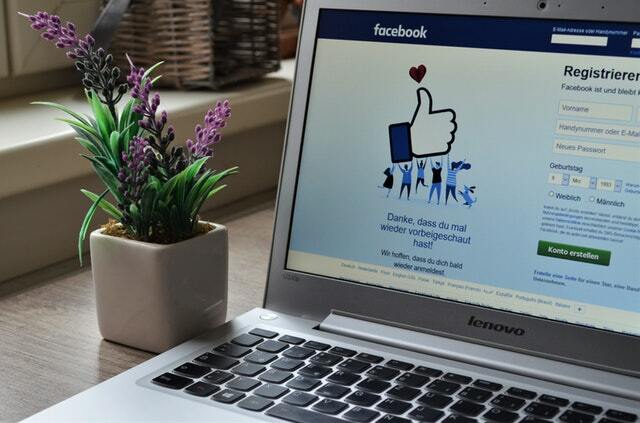 Your Facebook ad needs to provide value to the viewer. Without seeing value in your product or service, they have no incentive to click through or engage. Getting caught up in creative, focusing too much on buzzwords, or trying to appeal to every kind of user are all Facebook ad mistakes that detract from building real value. Instead, consider creating value in your Facebook ad with physical prizes, access to exclusive information, or by solving a customer pain point. Whatever you decide, be sure you’re incentivizing your audience in some way. Offering a prize for people as an approach mentioned above is one Facebook best practice to consider. Survey Monkey did just that by running a promotion that entered users for a chance to win from a suite of prizes. Providing enough of a reward: A $300 gift card is enough to entice people to click through and sign up. Depending on what you’re asking people to do, the incentive can be smaller or larger. Using an image of the reward: It may be a rendering, but the Facebook ad’s visual is enough to let users imagine themselves holding the gift card. Instilling urgency: The sweepstakes only runs for the month of November. 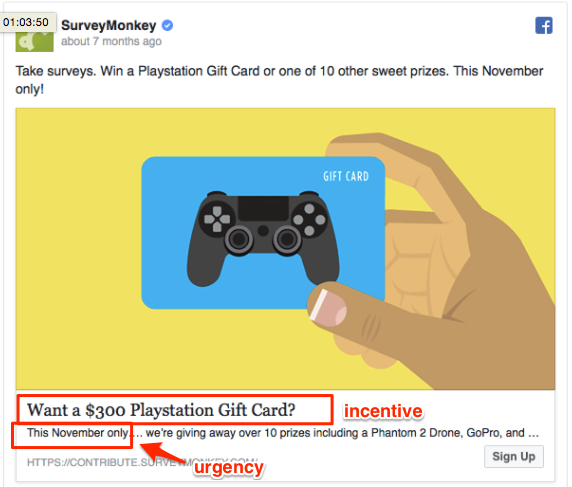 Survey Monkey’s Facebook ad mentions this twice, getting users to act quickly and making the ad more effective. Running a promotion through Facebook ads gets more Likes, Comments, and Shares for your brand. It also gets customers excited about any future contests, and makes them more likely to engage in the future. Just remember that there’s no single secret to success in Facebook marketing. 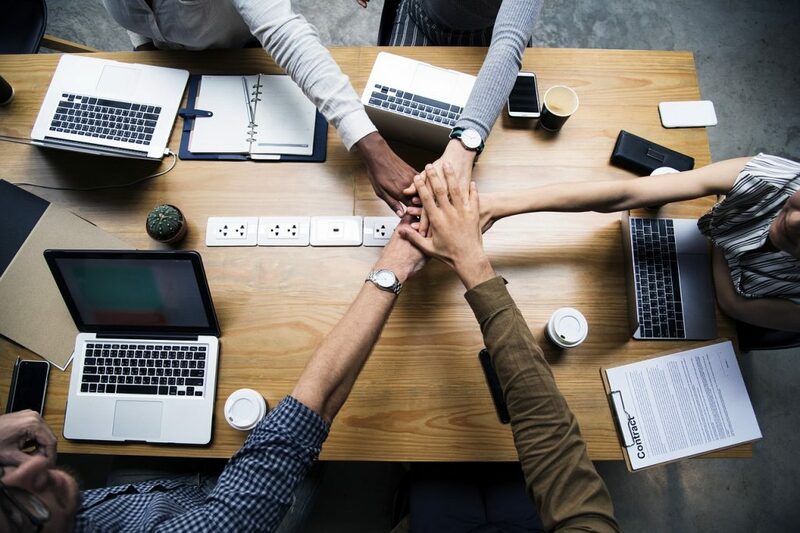 It takes trying a variety of tactics and seeing what resonates with your target audience to figure out the best social media advertising strategy. Looking to these examples as a guideline for what to do with Facebook ads can help you avoid the worst Facebook ad mistakes. Then you can figure out how to advertise on Facebook in a way that’s best for your brand.